The app also has the following options: - Move or delete any shape. 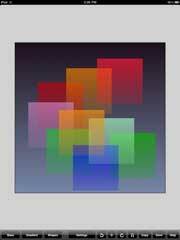 - Change the base colour behind transparent background gradients. - Rotate scenes 90 degrees CW, 90 degrees antiCW, 180 degrees CW. - Remove the background gradient leaving just the base colour. - Delete all shapes at once. - Make the area outside scenes lighter or darker to change perception. 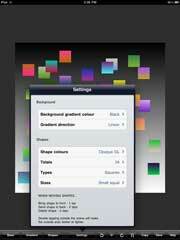 - Save a scene or just the background to the Camera Roll as a jpg file. - Copy a scene to the pasteboard. - Use any orientation of the device. - Access in-app Help. Double tap in the outside area to see how frame value (lightness or darkness) can affect your perception of a gradient. If the outside area is set to a light colour you may also be able to notice simultaneous contrast effects. Rotating scenes can improve or considerably unbalance your design. 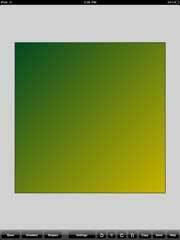 Copy a gradient and paste it into the Plain Background Fun app if you have it on your device. 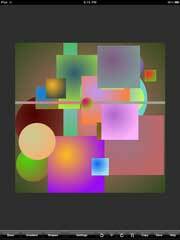 In that app you can analyse the gradient colours, or make a palette which contains them. 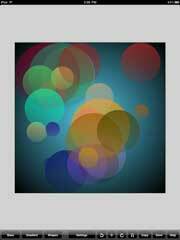 Save a background gradient that you like and set it as IPAD WALLPAPER. Gradients are especially effective behind icons on your device.